Pilgrim Spirit Communications had a big night at the annual conference of the Pacific Northwest Writers Association in July. 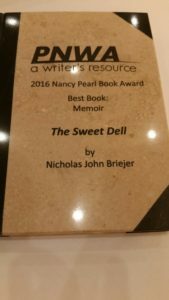 Nick Briejer, author of The Sweet Dell, received the 2016 Nancy Pearl Book Award for Best Book–Memoir at the organization’s awards dinner. Congratulations, Nick, the honor is well deserved! The Sweet Dell was edited and published by Pilgrim Spirit. Since the award announcement, we have begun production on an e-book version of The Sweet Dell, and it will be available soon for your favorite e-reader. Previous Previous post: Congratulations are in order!